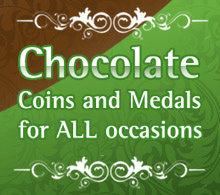 Heritage chocolate medals and coins are ideal for using in innovative sales promotions and incentives. Many organisations have used our chocolate coins and medals to promote a new product or service, mark an anniversary or used as give aways in exhibitions and functions. In addition to manufacturing the chocolate coins, we also offer a full design and packaging service, and can deliver a new design in as little as 6 weeks. Coins are available in three sizes - 127mm, 80mm, 32mm and can be packaged to order, nets of coins can be labelled with personalised swing tags and we offer a variety of foil colours. Larger coins can be hung on standard or personalised ribbons. We offer a full a design service and can deliver a new design in as little as 6 weeks. Origination costs start at £350 per side. In addition to our bespoke coins and medals for businesses, we also offer a standard range of designs which are ideal for give aways at events and functions.